Jazz, dope, and the lunatic fringe of literature. Jackson Pollock, Allen Ginsberg, Bob Dylan. Miles Davis, Billie Holiday, James Dean. This seminar examines the emergence of the American avant-garde in the years after World War II. 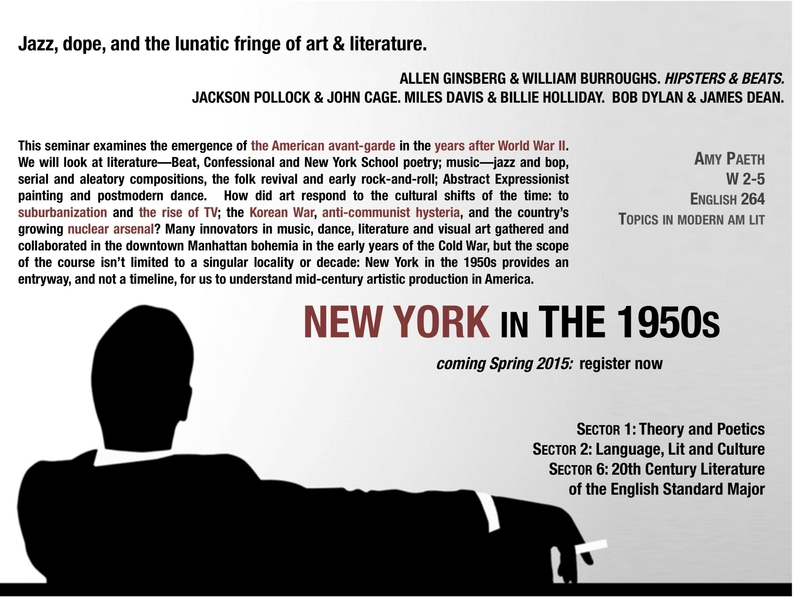 We will look at literature—Beat, Confessional and New York School poets; music—jazz and hard bop, serial and aleatory composition, the folk revival and early rock-and-roll; Abstract Expressionist painting and postmodern dance. How did art respond to the cultural shifts of the time: to suburbanization and the rise of TV; the Korean War, anti-communist hysteria, and a growing nuclear arsenal? Many innovators in music, dance, literature and visual art gathered and collaborated in the downtown Manhattan bohemia in the early years of the Cold War, but the scope of the course isn’t limited to a single locality or decade: New York in the 1950s provides an entryway, and not a timeline, for us to understand mid-century artistic production in America. Assignments: a short paper analyzing a literary passage and/or visual image; an in-class presentation on an author or artist included on the syllabus; a final paper.